When you raise your glass, it really helps to have a well-rehearsed line or two to say. We can help. This list of fun toasts can be used for anything from weddings to informal gatherings of friends. You will find a selection of traditional, funny, sincere and even unusual choices. We all want our friends and family to lead happy healthy lives and a toast is a way to communicate that. But, there are other reasons to raise your glass. The host or hostess traditionally goes first, but this is not required. Guests may offer toasts afterwards. At weddings, the best man usually makes a toast to the newlyweds. Make sure all glasses are full before starting. Any type of drink will work, not just alcoholic drinks. Stand and raise your glass before beginning your toast. Standing works well for formal occasions like weddings. Look the toastee or toastees in the eye. Sitting is more appropriate for informal gatherings and smaller groups like dinner parties. The crowd or group can remain seated, unless the speaker asks for them to stand from their chairs. Again, standing is a good solution for toasts at formal events and weddings. Choose from the great toasts from the list below. Commit it to memory or jot it down on a slip of paper. Speak clearly and loud enough for everyone to hear. Raise your glass and deliver, speaking with confidence. Take a sip from the glass. Others may follow with toasts of their own, so leave enough in your glass for others. The toasts that work best are delivered with confidence. Choose natural transition times for your toasts, like before the main course or when dessert is served. Know your audience. Keep your toasts simple and appropriate to the occasion. Humor is always desirable. Some humor can break tension and put people at ease. Keep your message as sincere and personal as possible. Don’t make the occasion about yourself. Be gracious when making toasts. These toasts can be used for any event or purpose. Some are funny and others sincere. Use them to put a smile on someone’s face or express your regards. A cheerful glass, a pretty lass, a friend sincere and true, blooming health, good store of wealth. Attend on one and you. Here’s to steak when you’re hungry, whiskey when you’re dry, all the girls you ever want, and heaven when you die. Here’s to a full purse, a fresh bottle, and a beautiful face. the best things on earth. Here’s to thee and thy folks from me and my folks! ever loved any folks half as much as me and my folks love thee and thy folks. and the peace of our nation! Thank God, you and I, for it’s continuation. May every day bring more happiness than yesterday. and a hearty wish for your happiness. shine over and above you always. A popular topic for toasts is drink itself. Raise your glass while drinking whiskey, wine, beer and other spirits and say the right words. Select the perfect option for your occasion from the list below. Cheers! Swear off, and you drink alone. Here’s to a long life and a happy one. A quick death and an easy one. And, a good girl and a honest one. A cold pint and another one. Life is a waste of time, and time is a waste of life. Get wasted all the time, and you’ll have the time of your life! but a damned sight more sincere. Here’s to abstinence – as long as its practiced in moderation. May the bloom of the face never extend to the nose. Here’s to a long life and a merry one, a quick death and a happy one, a good girl and a pretty one, a cold bottle and another one. that man made wine to drown trouble in? In water one sees one’s own face. And dream of their charms while you’re under the table! Look out, belly, here it comes. Wine and women—may we always have a taste for both. All the girls you ever want,. Here’s to good food, good fortune, and good whiskey! May you live to be forever and that mine is the last voice you hear. I mean a shot of whiskey! Then how the hell can he drink when he’s dead? And then I’ll know my bones will keep. Toasts for your friends or the host at your next dinner party. Here’s a list with the appropriate lines to deliver. These are arguably the best kind of toast. We recognize them with our glasses. Rare good luck and pleasant ways. with the friends we’ll never forget. The fun that they are missing! Tip: When making one of these toasts, first check to see that everyone has a drink in hand. Then, make sure you’ve captured their attention. Then, begin. be filled to the brim whenever you sup. Here’s champagne to our real friends, and real pain to our sham friends. and can’t tell the difference. Health and well-being tributes have been used extensively throughout history. Use them to wish the best health for someone! Here’s to your good health and your family’s good health and may you all live long and prosper. Here’s to your health. May God bring you luck, and may your journey be smooth and happy. A toast to your health. May we drink one together in ten years’ time and a few in between. Where this is going, there’s gone many a quart. Here’s health to those I love, and wealth to those who love me. Here’s to health, peace, and prosperity—may the flower of love never be nipped by the frost of disappointment, nor the shadow of grief fall upon a member of this circle. Note: If you have some salutations you’d like to share, please let us know via the contact page. To you, and yours, and theirs, and mine, I pledge with you, their health in wine. Too your very good health. May you live to be as old as your jokes. Here’s health to all who need it. And may fortune smile on them the rest of their lives. I’m beginning to worry about my own. Here’s to your health and a hearty wish for your happiness. 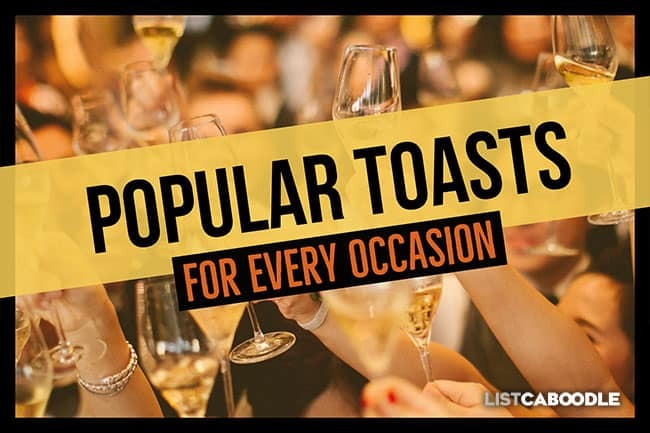 This list contains great toasts for holidays. Use them when people are gathered for the next holiday or seasonal event. To blow the darn things out! and be a jolly soul. No other can equal it during the year. That’s what I’m wishing for you—you bet! We’ll drink a Christmas toast together. Definition – What is a toast? Synonyms for toasts: Tributes, Salutations, Tributes, Salutes or Cheers. Mayt you wet your whistle well and may we never die of the drought. May you be plagued with an itch and no nails to scratch. That your patch of trouble may not cover the hole in a leprechaun’s breeches. May the good Lord take a liking to you but not too soon. Six eggs to you and a half a dozen of them rotten. Here’s a health to St Pat! of drinking to one saint more! May your bed be soft and your man’s hand along with it. Drink up! It’s always the next one that sickens you. When the last train leaves for heaven, may you still be in the waiting room. And skies above be blue. makes gobblers of us all. The perfect setting for some well chosen words is at a wedding. Often the best man delivers a toast to the new couple at some point during the ceremony, usually around the dinner. These tributes cover all topics of love, including wedding, marriage and romance. A toast to love and laughter, and happily ever after. Here’s to the bride and the groom! The only fire against which there is no insurance. Here’s to the love that lies in a woman’s eyes, and lies, and lies, and lies. and the latter always remain the former. sit under the bed together. Drink to life and the passing show, and the eyes of the prettiest girl you know. and please whom we kiss. To the three rings of marriage: the engagement ring, the wedding ring, and the suffering. If she lives too long alone. Here’s to the girl, that’s true. And still gets all the fun there’s in it. Fair days, fair times, and fair ladies. Tip: For all of these toasts, delivery is so important. Practice a few times by yourself before trying with friends and family. May your luck ever spread like jelly on bread. To my friend: luck til the end! May Dame Fortune ever smile on you, but never her daughter: Miss Fortune. when he thinks he is hugging his own. Here’s to the good girl! and we don’t like dead ‘uns. Let’s pray they never meet. She certainly could do it. Here’s to old wine and young women! Heaven to my soul, and I wish you no worse. May they never grow mulish. To a full belly, a heavy purse, and a light heart. Here’s to my wife—wish her long life! She knows how to ew and still calls me her beau. Here’s to your bright eyes and here’s to mine. Here’s to your sweet lips and here’s to mine. Our eyes have met, our lips—not yet. Here’s to the lasses we’ve loved, my lad. These toast range from the very unique to the most famous toasts in history. You are sure to find one that suits your next event, whether it be a wedding or holiday gathering… or just a group of good friends enjoying the moment. You’re on best toasts page.